A bout of flu, car accident, or cancer diagnosis too often leads to a family economic crisis. Most workers have only limited paid leave to deal with their family health needs, and many have no leave at all. The Work and Family Agenda assures that everyone has Paid Sick Days for preventive care or when a nasty virus hits, as well Family and Medical Leave Insurance for the handful of times in their careers when they need longer periods of time off – to welcome a new child, recover from surgery, or care for an aging parent. It will be a tough session, but with your help we can show legislators why paid sick days and paid family leave are so critical for building healthy families and a strong economy. 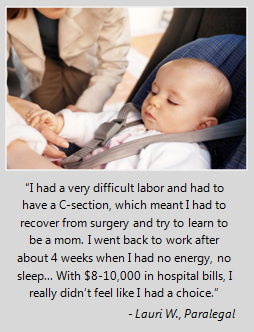 Click here and share your story about a time paid sick days or paid family and medical leave would have helped you. In 2007, Washington approved FMLI to provide parents of newborn or newly adopted children up to 5 weeks of partly paid leave. FMLI as originally adopted was too skimpy. It also wasn’t funded and has been delayed until 2015. “Safe leave” to deal with effects of domestic violence, sexual assault, or stalking.